AS the outcome of a period of intense development in the British coastal trade in recent years new ships of all kinds have been built. 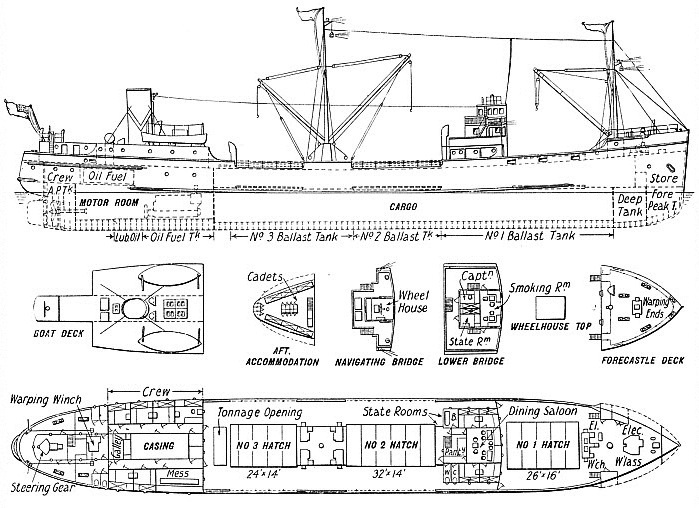 The ship illustrated below, the British Coast, is one of a special class. She was built for the Coast Lines seaway, between London and Liverpool, and makes calls at intermediate ports such as Southampton, Plymouth and Falmouth. Built by Henry Robb & Co, of Leith, she is a fast vessel. (Gross tonnage 889.) Cargo can be handled quickly, and she has comfortable accommodation for twelve passengers. The British Coast type of ship has done much to develop the coastwise transportation of passengers. This development will probably be similar to that which has taken place in the big motor cargo-liner type illustrated in Merchant Ship Types No. 2 (page 98). In ships of that kind luxury accommodation is offered to a small number of people. The British Coast, in common with many recent coastal craft of all sizes, is Diesel-propelled. She has a pair of single-acting four-cycle airless injection units, of Atlas Polar type, with a total of 1,250 brake horse-power at 220 revolutions per minute. Each engine has five cylinders of 13·37-in diameter and 22·43-in stroke. These are arranged at the aft end of the ship. Various auxiliary Diesel engines of high-speed type are arranged aft and between the shafts, coupled directly to electric generators. Current from these generators is taken to operate all the pumps in the engine-room, as well as the steering gear, winches and windlass on deck. As with most modern coasters, the vessel has her machinery aft. This gives a a long single hold of some 92,000 cub. ft. capacity, and ’tween deck space, the ship having two decks. The hold is faced with wood on the sides and tank top. It is thus suitable for the carriage of all kinds of general cargo. There are three hatches serving these holds - one forward and two abaft the bridge structure. This contains accommodation for passengers, as well as for officers. It also accommodates the navigating bridge. There are two masts, one at the break of the short forecastle which is used entirely as a store, and one between Nos. 2 and 3 hatches. There are two derricks, which are used for handling cargo, on the mainmast. One serves either hatch and one special slewing derrick serves No. 1 hatch.